It’s not often I have leftover steak kicking around but today…I had leftover steak kicking around. Since one of my favourite things to throw together is an original and inspired grilled cheese sandwich (if you haven’t noticed that by now, you can’t possibly call yourself a Killing Thyme follower! 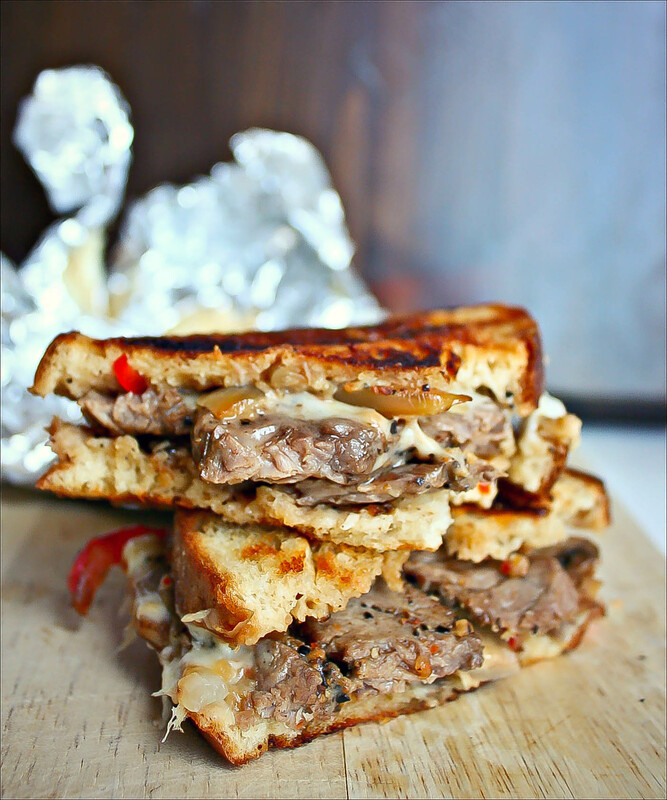 ), I found this to be a perfect opportunity to use up my leftover steak (grilled to a perfect medium rare, oh my) in a Philly Steak Grilled Cheese, complete with sauteed onions, peppers, and mushrooms. To make things even more ‘amazeballs’, I decided to grill this sandwich on, yes, THE GRILL. Hey, we’re calling this a grilled cheese – let’s make it so! No pan, no stovetop – just tinfoil and the heat of an open wire grid over fire. Pre-heat the grill – medium heat. Heat 1 tbsp of butter in a skillet. Blend in the dry mustard, then sautee the onions, peppers, and mushrooms in the skillet until tender. Remove and set aside. In the same skillet, throw down the slices of steak and sprinkle with the Montreal Steak Spice, evenly on each side. Toss the steak for approx. one minute (or until cooked to your liking). Remove from heat. Use the remaining butter to butter one side of each slice of rye. You don’t need much. Place the rye, buttered sides down, on a 10 x 10 inch (approx) sheet of tinfoil. 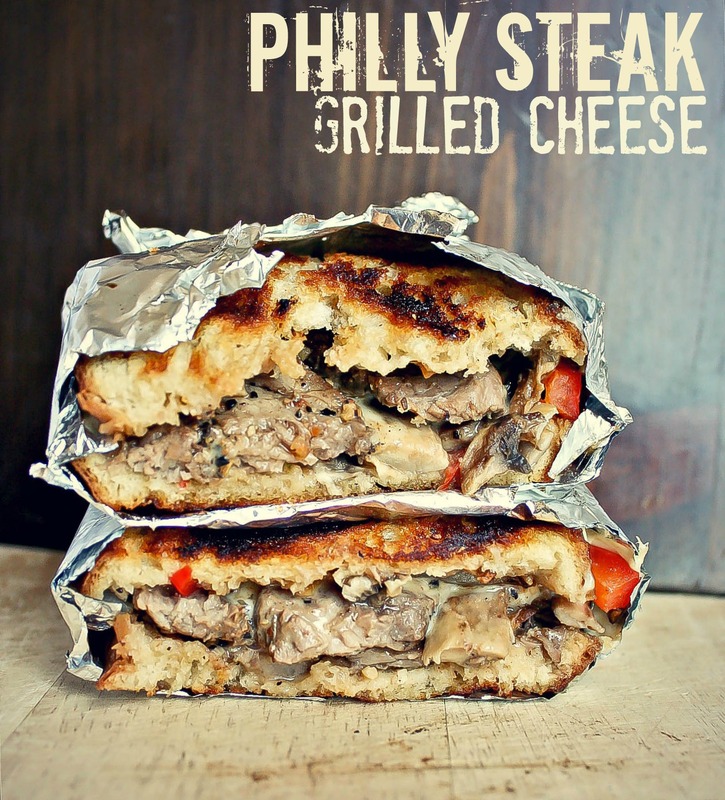 Layer the sandwich with the steak first, the mozzarella cheese, and the vegetables. Close the sandwich and tightly wrap it in tinfoil. Place on grill, and grill 2-3 mins. per side. I love this Recipe and will try it . I was also clicking on the links below and noticed there are many that are Dead . You have a great Site here and Love to cook . Thank you for a great information. Looks really yummy. I like to eat Steak. You're very welcome! Thanks for taking the time to comment! THIS LOOKS POSITIVELY AMAZING! MY HUSBAND WON'T EAT CHEESE, ): , BUT I SURE WANT SOME!! UN-BELIEVABLE! Thank you! I hope you try and enjoy!